Hello everyone and happy July!! 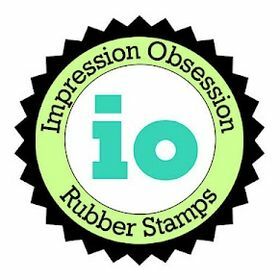 Since it's the first of the month it is time for our Digital Stamp Release and Blog hop over at Whimsy Stamps. We have several new gorgeous images to show you from Moon Cookie Gallery, Stamp Art Designs, Crissy Armstrong and a few recently released ones by Meljens too. I hope you'll hop with us to see all the amazing creations by the Design Team. If you arrived here from Sheri's blog you are in the right place, if not you will want to to go Therese's blog to start hopping. Don't forget to leave comments along the way for some chances at winning. There will be 2 random blogs that will draw one winner each from the comments left, and then at the end of the hop one commenter will win 5 of these newly released digis and will have a chance at showcasing them as a guest designer for the month of July. For my card I used an image by Whimsy's Moon Cookie Gallery "Sparkle Butterfly". It has been colored with copic markers. The sketch was inspired by a card from the new Stampin Up catalog. I just fell in love with it and thought it was perfect to showcase this beautiful butterfly. I love how this card turned out, I just love these colors together! Now your next stop on this hop is Tine's blog. And don't forget to leave comments. 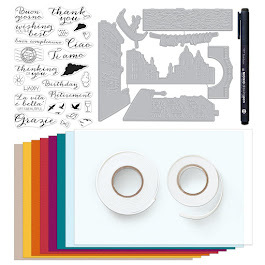 If you get lost along the way simply go to the inspiration blog for the complete list of stops.There you will also find several more creative ideas made with the new released digis from team A of the Whimsy digital team. And that is all for today. 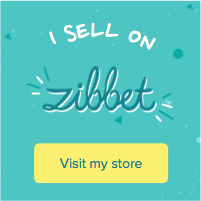 Thanks so much for stopping by my blog and enjoy the rest of the hop! Your card is beautiful! I love the clean design and the colors you used. The little antena's you added are so cute. Nice idea for a card. The sketch really showcases the little butterfly. Hi Ellie, this is a simple but really beautiful card !! Wow, so Clean & Simple but so effective! Thank You for sharing your lovely card with us this week at Lexi's Creations! Hope to see again next time! Your card is simply beautiful. I really like this clean and simple card. The way the butterfly pops out is great! You have made a gorgious card. I like to hop along! Have a sunny day, gr. Mariken. Oh, your card is so simple beautiful!! Such a sweet card! I love butterflies anyway so that makes it that much more special.. This is a fabulous card Ellie, love it!!! Oh, I miss you too on the DT, wish you could come back to us some day, but I always love to come for a visit here. A fantastic card, Thank you so much for entering our challenge at Truly Scrumptious this fortnight, good luck & hope you’ll join us again! I love your beautiful little butterfly on your lovely card! 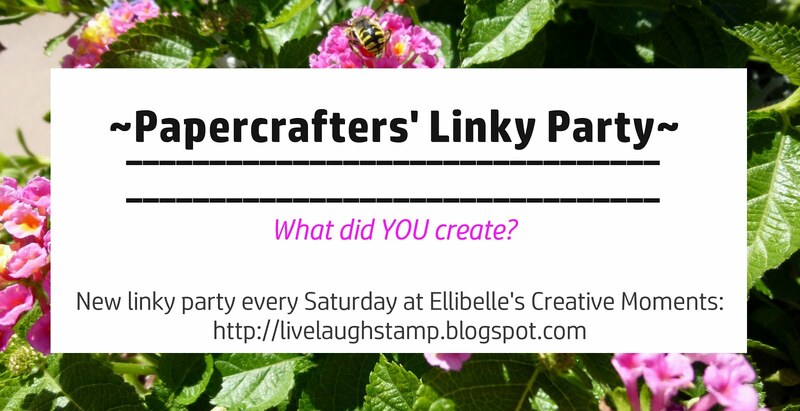 I linked over from Make it Monday where I've linked too (#16). Very pretty, CAS but nicely done. 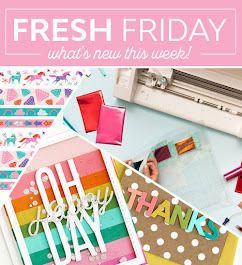 Thanks for playing along this week at Paper Sundaes! Beautiful card clean, simple and absolutely gorgeous and I love it. 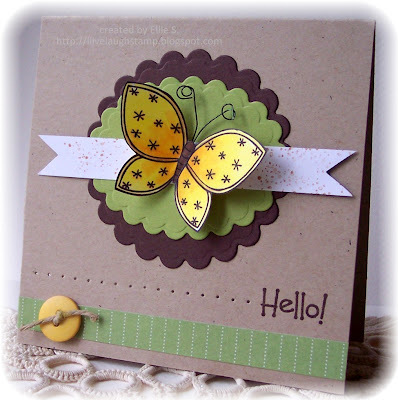 Such a sweet card, lovely butterfly! Oooh, I love kraft and this is wonderful! Beautiful colors and I think the piercing adds so much (I alwasy forget about doing it!). Love that butterfly to. So happy you joined in the fun with us this week at Simon Says Stamp and Show. Beautiful clean & simle card, thanks for playing at TPS this week. Simple but yet adorable card. Nicely done! Thanks for playing with us at MMCS challenges this week! I totaly love the colours and how you put the butterfly "on the outside-sort of"!! Love this for some reason makes me think of expensive chocolates not sure why thanks for sharing and lovin the hop. This is gorgeous! I don't remember seeing it on our Yahoo site so am glad I am finally visiting blogs so I could see it.